I imagine that the administration has been blindsided by this one….Had this been written into the law, it probably would have passed unnoticed, but the farther this presses into the spotlight, the harder it’s going to be to arrive at a politically acceptable answer. Chalking this one up to the cost of passing multi-thousand page bills that no one has read. Hah hah! Stupid Democrats didn’t even read their own bill! I imagine we’re going to be inundated with stuff like this over the next few years, as critics of reform crow over every story that suggests even the remotest possibility of some negative outcome on one benighted group or another. But here’s my prediction: virtually none of these self-serving pity stories will amount to anything. through the rest of the story, you find that most students are insured through their parents’ policies. 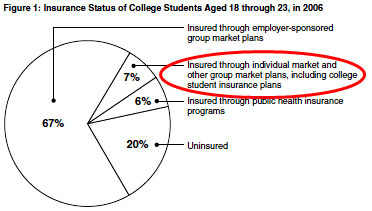 According to the GAO, “only 7 percent bought their own policies or purchased school-based plans.” Add to that the fact that so far there’s no real evidence that healthcare reform will seriously impact student health policies anyway (colleges are merely “warning” that it might) and that a lot depends on the rules HHS sets, which is all part of how healthcare reform is designed to work. HHS rule setting is a big part of the process and was always intended to be. So: do I expect vast hordes of angry students descending on Capitol Hill? No. Do I expect HHS to sit around and do nothing about this? No. Do I expect that some reasonable set of rules will be worked out in the end? Yes. Do I expect that critics will take any notice of the fact that yet another scare story about healthcare reform will turn out to be overblown and ridiculous? No indeedy. The Mueller Report Was Just Released. Read It Here.